In 37th century, most of humanity has been wiped out. Competing warlords have harnessed the essential knowledge used for eons by the Galactic Elders to maintain stability throughout the universe. These Creation Units include Bio-Acceleration, Neurogenesis, Digital Splicing, and Raw Material Animation, which been unleashed by an unknown force. The knowledge of Creation has spread causing unchecked mass-extinctions across the galaxy. The Galactic Alliance need to seize back control and have enlisted the help of humans across temporal planes, a Hyper-Card technology allows you to take part in planetary battles and help re-establish order. WARNING: This is a preview of Psi Wars. All components and rules are prototype and subject to change. Psi Wars launched on Kickstarter on May 15, 2018. Psi Wars is a two player card game created by a father-and-son team, Michael & Adeev Wohl. My kids and I are always so excited to explore games designed by families! We love to see that passion and teamwork getting results in the real world. It's very rewarding for us to be able to support other gaming families. Psi Wars is dripping with theme! We're rocketed forward to the 37th century where our cyborgs, robots, and other beings are created and powered through neurogenesis, digital splicing, bio-acceleration, and more. 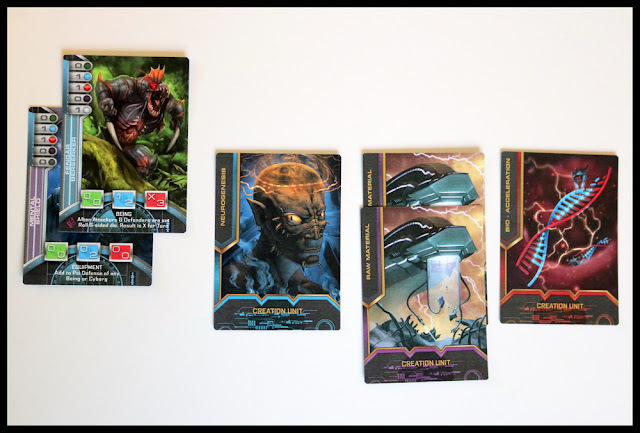 The names of the cards and the illustrations make the futuristic battle scene rich and engaging and help you get into the mood of the game as you play. 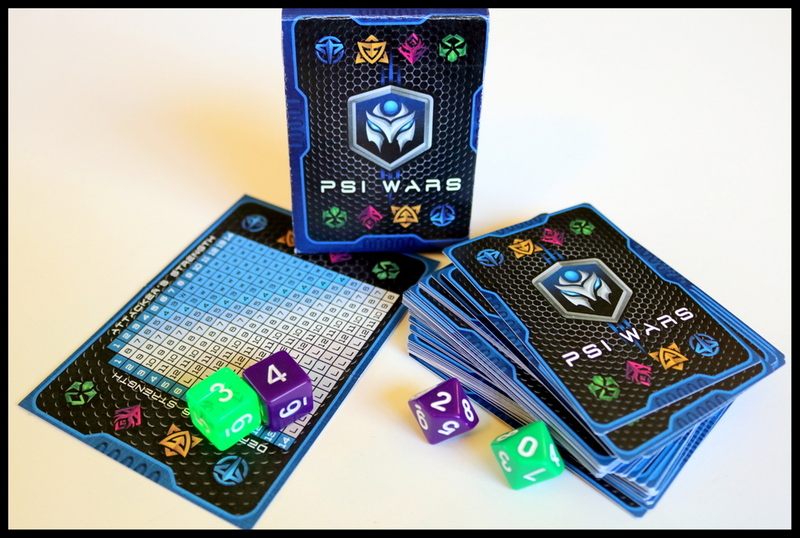 Psi Wars is intended to be an expandable card game. For now, the starter decks are launching on Kickstarter as a 54-card deck for each player; a deluxe version is in the works using proprietary 3D technology to add a lenticular type printing giving the cards a moving, holographic feel. 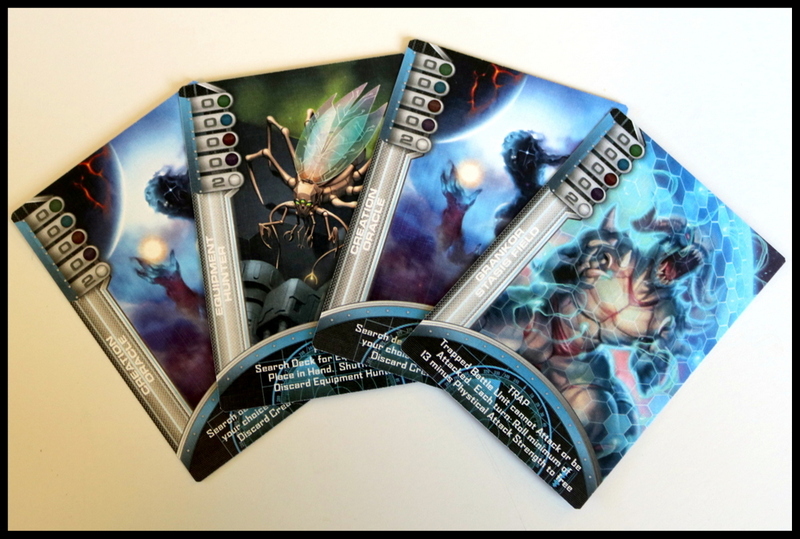 The starter decks for Psi Wars contain three basic types of cards—Creation Units (the building blocks for bigger things), Battle Units (the forces you will control in battle), and Equipment (that you can attach to your Battle Units). In addition, each player has a pair of d6 for battle, a pair of d10 for tracking life points, and a Battle Outcome Probability Matrix for determining which battle rolls are successful. Although the components in my preview copy were not final, our family definitely enjoyed the dark, slightly-scary, futuristic artwork and appreciated the clarity of symbols and text on the cards. 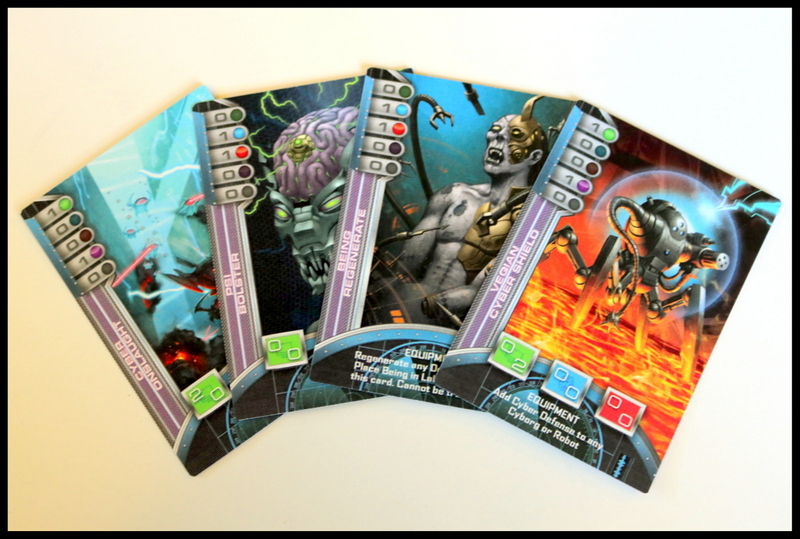 Psi Wars has a two-player card game mechanic that is at once familiar and new. 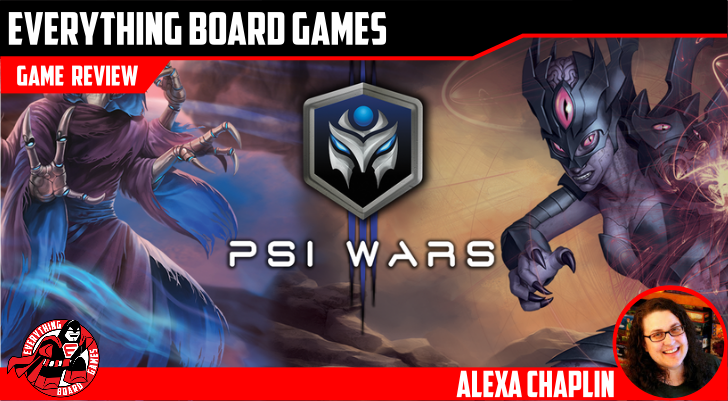 Players who are already familiar with Magic: The Gathering or any similar two-player deck building games will have an easier time sliding into the play of Psi Wars. Each player draws cards from their own Psi Wars deck into their hand and plays cards onto the table in front of them (their Lab space). Creation Units are tapped when used to bring Battle Units or Equipment into play. Each Battle Unit can have one piece of Equipment. When you feel that your force is strong enough, you can choose to attack your opponent's Lab, hoping to destroy their Battle Units and eventually their Lab itself. That all feels very comfortable to us as life-long gamers. Attacking in Psi Wars is different from other games of this style. Instead of strictly relying on the numbers on your cards, you use those as a guide to determine what attack roll you will need to reach on your 2d6. 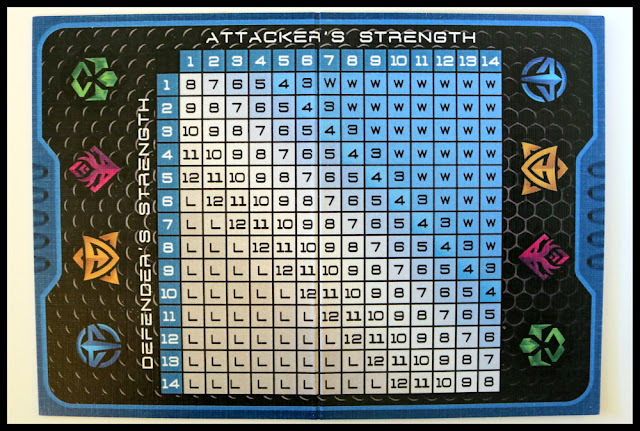 You check the Battle Outcome Probability Matrix to find that number—for example, an attacker with strength 5 battling a defender with defense 4 would need to roll a 7 to win the battle. Our family found this mechanic to be a good mix of strategy (building up good cards) and luck (still needing a die roll to win). It helped keep things balanced for a game of Psi Wars with a parent and child—the parent's possibly superior strategy (mine!) could easily wilt in the face of the child's jaw-dropping luck with die rolls (hers!). More unique points are still in store. 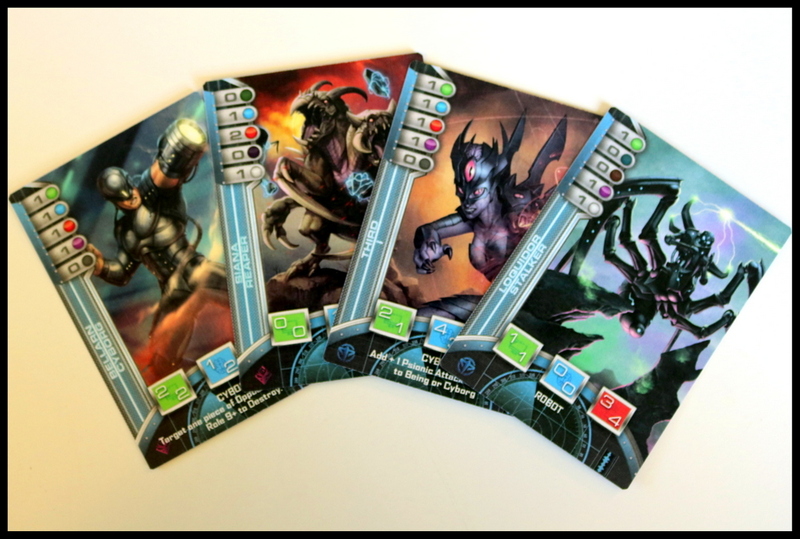 In Psi Wars, battles happen in three different types—Cyber, Psionic, and Physical. Each Battle Unit card has attack and defense scores for each of the three types of attacks (though sometimes these are 0). In a battle, the attacker first chooses Cyber or Psionic to try to disorient the defender before moving on to a Physical attack to defeat them. This was the most confusing part of learning Psi Wars as a family, because you need to understand whether the defender gets to counterstrike and in what situations. There is a tutorial video to help with that (found here), but in the end I wound up sketching out a flowchart for my kids to help them understand the way a three-layered battle worked. Since my rulebook was still in prototype form, I'm hopeful that the creators will include a visual-style Battle Flowchart for the visual learners. Once we learned our way around the three types of battle, the game moved along well for us. The goal is to cut through your opponent's Lab line of defense and make Physical attacks that are not defended and damage the Lab itself. Reducing your opponent's Lab to 0 points makes you the winner of Psi Wars. We loved that Psi Wars is designed by a father-son team. The Kickstarter introduction video starring both of them is well-crafted and adorable! 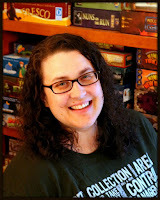 We are rooting for a family to do well designing and publishing games together. 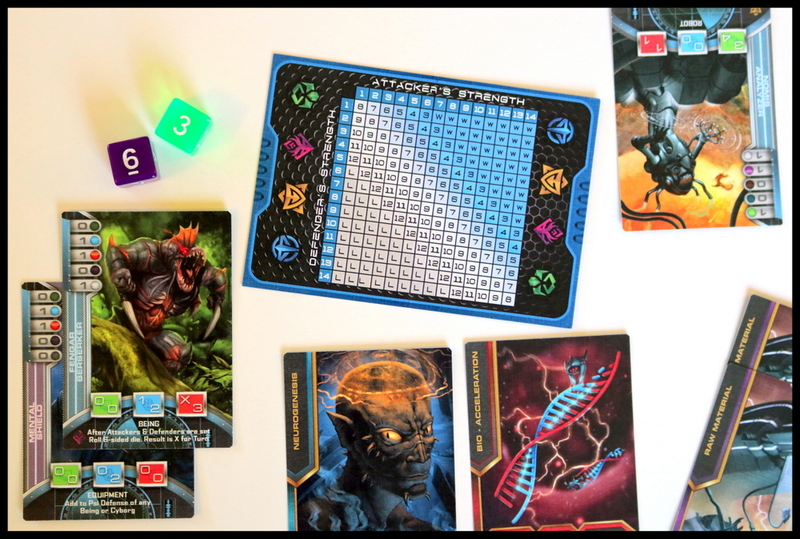 The theme of Psi Wars is very engaging for geeky families like mine who enjoy science as well as science-fiction. 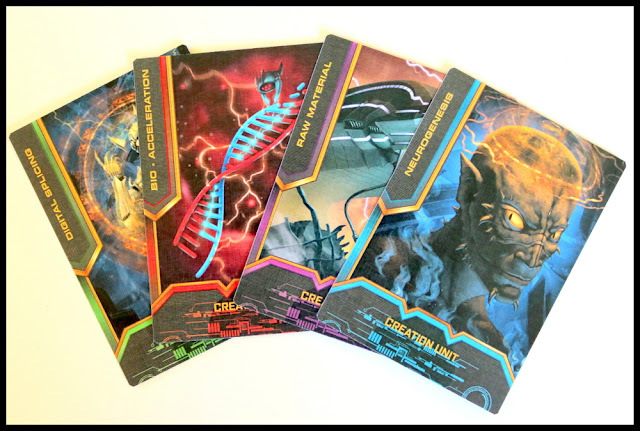 The artwork and graphics on the cards were well done, and we're eager to see the final results of the deluxe 3D decks. 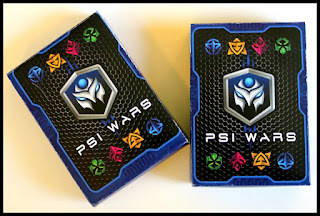 The battle mechanics of Psi Wars—both rolling dice according to the matrix and having three types of battle in each encounter—were unusual and added a layer of interest and complexity to this game, setting it apart from other two-player battling card games. The hardest thing for us was learning to play Psi Wars—particularly the flow of battle through three different types with three possible counter strike attempts. A visual flowchart in the instruction manual or possibly as a single-card player aid would go a long way towards making that learning curve less steep. We also had a few playthroughs where the initial hands seemed very unbalanced and allowed one player to take a strong, early lead. In one of the videos, the creators suggest having new players start with one of each type of Creation Unit in hand. My teen son went a step farther to suggest that for new/young players, we come up with a starting hand of 8 cards—one of each type of Creation Unit and then three of the more basic Battle Units and a piece of Equipment—to keep things more balanced. Players who enjoy two-player battles such as Magic: The Gathering, Ascension, Smash Up, and similar games will find Psi Wars satisfying. Fans of futuristic sci-fi will be engaged too! 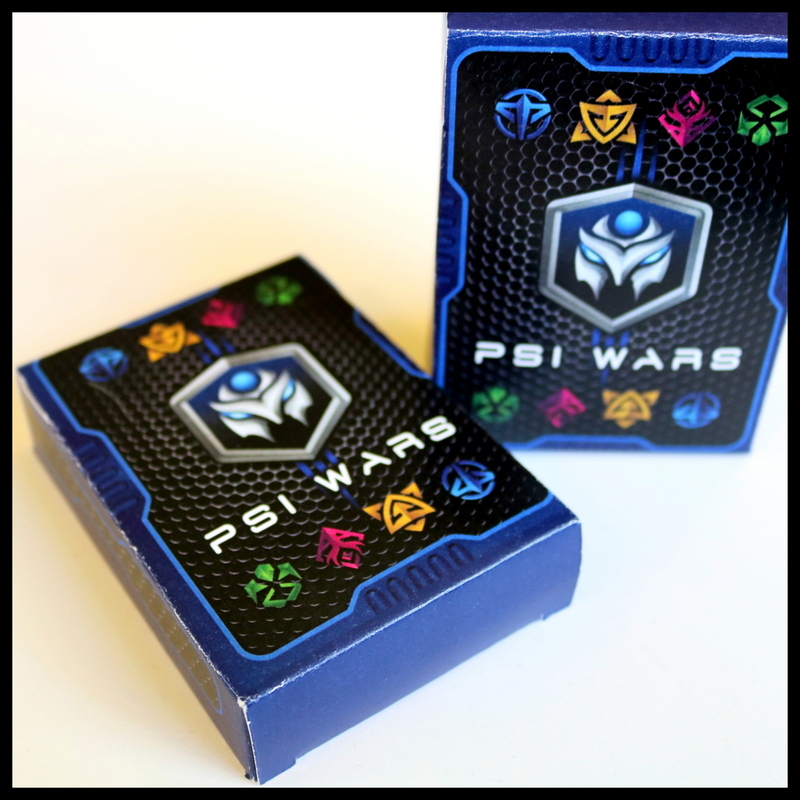 Psi Wars is a strategic, deeply thematic card game battle for two players that had our family drawn into the building and equipping of robots and cyborgs and on the edge of our seats for the results of suspenseful dice-driven battle outcomes. We cheered on our favorite brutes and wailed at our lack of bio-acceleration: any game that is this engaging even before planned expansions is a keeper. Good luck to Adeev and Mike on your upcoming Kickstarter! Psi Wars is on KICKSTARTER Now! Campaign ends June 15, 2018.